An unknown tile panel brought to view - and back to life ! 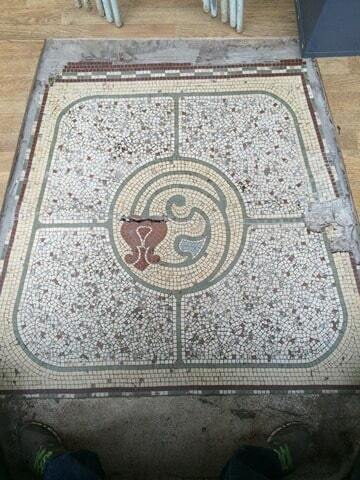 A coffee shop in Piccadilly, Hanley, Stoke-on-Trent took up some floor-covering and discovered that they had a fine tile mosaic in their doorway. Unfortunately, the panel had obvious damage, which may explain why it had been covered up in the first place. To those of us who are part of the 'Ceramic City Stories' group, this gave us opportunities for research as to which company manufactured the panel and when it was installed. Danny Callaghan, who coordinates the group's activities has a special interest in tiles and Simon Ball, another member of the group, specialises in renovating tiles. Work on renovating the panel is nearing completion and, once completed, the coffee shop intends to leave the panel on display, protected by armoured glass. 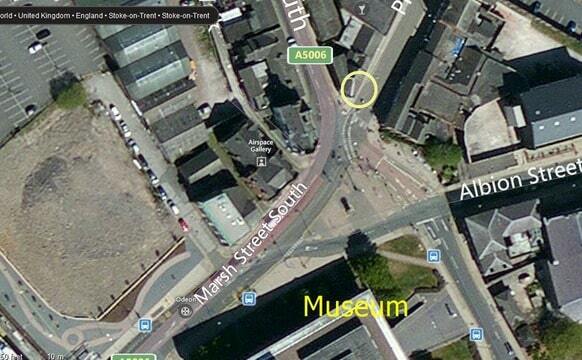 Location of Tsp coffee shop at the junction of Piccadilly and Marsh Street south in Hanley, Stoke-on-Trent. For several decades a branch of the Prontaprint chain occupied the bottom shop on the right-hand side in Piccadilly, Hanley - circled in the aerial view attached. Before then it was occupied by Harris 'Electrical Engineers' and the shop was called 'Electricity House'. 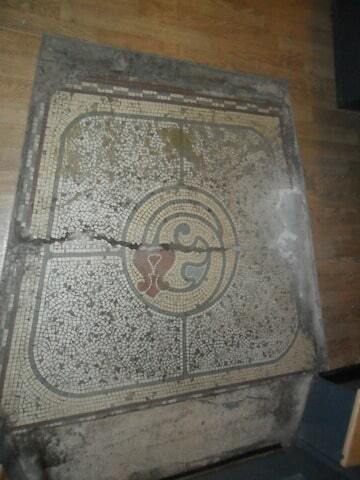 Recently the premises became the home of the Tsp coffee shop and, in November 2014, the floor covering was raised to reveal a fine mosaic tile panel inside the doorway. As can be seen from the attached photo, parts of the panel were in poor condition. Tsp mosaic tile panel - as found. A short video of the Tsp tile panel 'as found'. 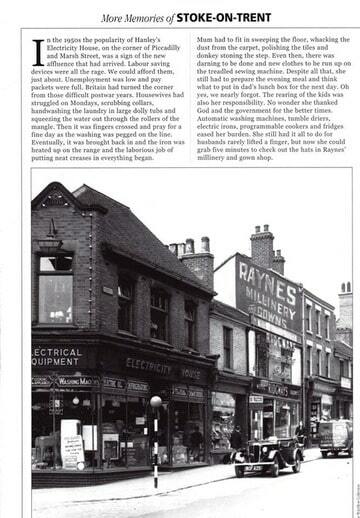 An excellent photo and description of the premises from one of the many excellent local history books when it was known as Electrical House. By examination of trade directories we know more about the history of the shop premises. While it is generally possible to identify ceramics by examining the 'backstamp', this isn't possible in the case of tile mosaics as the individual tesserae which make them up are too small to bear such identification marks. 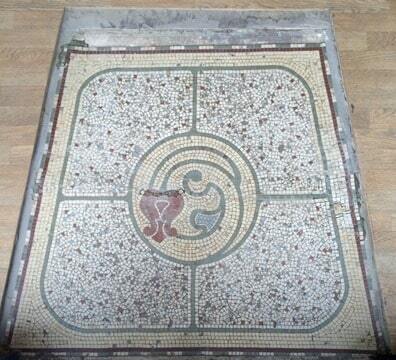 The design, manufacture and fitting of such a mosaic panel would have been carried out by a specialist company. While we do not yet have direct evidence, the current thought is that the panel may have been produced by the local 'de Cecco' family company. This company was set up by immigrants from Italy : the main site was - and still is - in Glasgow, but there was also a branch in Stoke-on-Trent. The Glasgow factory has no records relating to work done in this area and the Stoke-on-Trent branch closed a few years ago. We are currently in contact with local members of the de Cecco family to see if they have any information available. 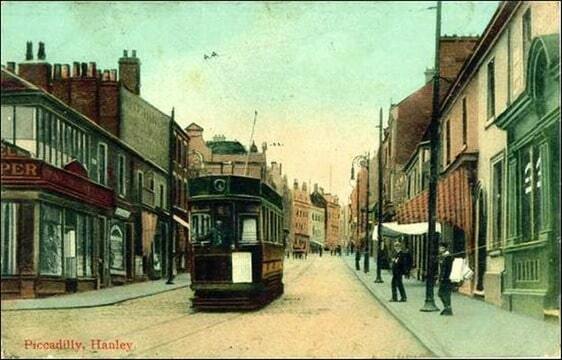 A fine colour view of the premises (bottom left), complete with passing tram. 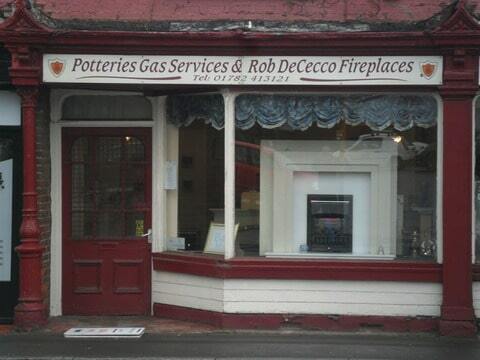 The former Rob De Cecco shop in City Road, Fenton, Stoke-on-Trent. Tsp panel restoration nearing completion. A member of the 'Ceramic City Stories' group is a specialist in tile renovation and he has been working on this panel. While work is not yet complete, the panel is looking very much better than it was and is a real asset to the shop. This is the very latest image of the mosaic panel.